A 4 kW geared motor directly drives a camshaft that operates the stainless steel division box, nickel cast iron knife and nylon dies. The nickel cast iron ram is driven by a separate 3.2 kW servo drive motor. The ram pressure can be adjusted to suit individual products for minimum dough damage. 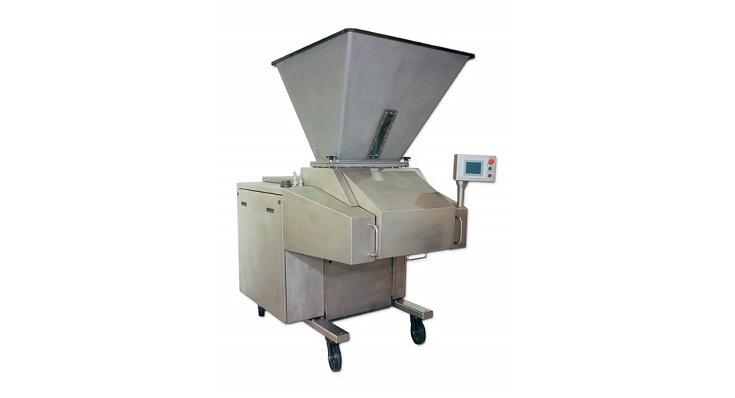 A 630 kg capacity hinged bulk hopper with dough breaker bars to cushion the impact of the dough, all with non-stick internal coating. Fitted with one small vision panel in the front to view the dough level. Gives total capacity of 680 kg. A docking frame (floor mounted) is included to locate the Divider positively, whilst giving quick wheel-in/wheel-out facility. Primary and secondary conveyors mounted on the docking frame with their drive speeds synchronised with the Divider. Includes guarding to the divider discharge area. The conveyor belt material is a Novo25 felt top belt. Belt may be easily removed for off-machine cleaning.